Moscow in the DOS version of Mario is Missing! Moscow in the SNES version of Mario is Missing! Moscow (Russian: Москва, Moskva) is the capital city of Russia. It appears in all versions of the game Mario is Missing! In the Nintendo Entertainment System release, the entrance to Moscow is located in the fourth room, alongside the one leading to Montreal. It appears much earlier in the Super Nintendo Entertainment System version, in which it is one of five cities Luigi has to visit in order to defeat Ludwig von Koopa on the first floor, the others being Rome, Beijing, Nairobi and San Francisco. 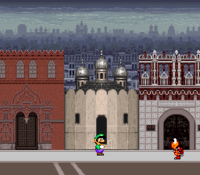 During the events of the game, Moscow is full of Koopa Troopas, and in order to secure the city, Luigi has to visit three landmarks and return one artifact to each that was stolen by the Koopas. The three landmarks are the Kremlin, St. Basil's Cathedral, and the Bolshoi Theater. In the PC version, the Koopas have also robbed two additional landmarks: Lenin's Tomb and the Moscow Metro. Moscow is also mentioned in The Super Mario Bros. Super Show! live-action segment "Captain Lou Is Missing". Officials from the city send Cyndi Lauper a message stating that the missing Lou Albano was nowhere to be found, and request more 8-track tapes. Mario suggests to send them his Jim Nabors tapes. "Wow! I'm not sure they planned it but it's the biggest country on the planet." "Welcome to the home of the world's largest department store. Its Cyrlik[sic] initials spell out GUM." "I'm confused...one quarter of this country is in Europe and the rest is in Asia." "It's a name game. First it was Russia, then the Soviet Union, now it's Russia again!" "From Moscow you can ride the Trans-Siberia Railway 9300 kilometers through two continents." "Russia's largest lake is called the Caspian Sea. Do you see how a lake can be a sea?" "100 kopeks to each ruble is the rule. All Russian children learn that in school." "It doesn't matter who you czar, Moscow has been the capital of the Soviet Union since 1918." "USSR, Russia, Soviet Union...when Pushkin comes to shove, Moscow is a place to love."